Navigate to the Contact Manager. To add a new Contact, press the "New" icon in the toolbar. To edit an existing Contact, click on the Contact's Name or click the Contact's checkbox and then click on the "Edit" icon in the toolbar. This section will be labeled New Contact if you are creating a new contact. If you are editing an existing contact this section will be labeled Edit Contact. Featured. If marked yes, the item will be displayed in featured view. Other Information. Other information about this Contact. No HTML is allowed in this field. Created By Alias. You can enter here an alias to be displayed instead of the name of the user who created the contact. E-mail. The Contact's e-mail address. Note that e-mail addresses in Joomla! can be protected from "spambots" by enabling "Content-Email Cloaking" in the Plug-in Manager. This is enabled by default. City or Suburb. Hide or Show the Contact's town or suburb. State or County. Hide or Show the Contact's state or county. Postal Code. Hide or Show the Contact's postal code. Mobile phone. Hide or Show the Contact's mobile phone number. Webpage. Hide or Show the Contact's web site URL. Misc. Information. Hide or Show any miscellaneous information entered for this Contact. Image. Hide or Show the Contact's image. vCard. Hide or Show the vCard link for this Contact. Note that the "Enable vCard" option in the Contact Manager - Options must be set to "Show" for this option to work correctly. Show Profile. If this contact is mapped to a user, and if this is set to Show, then the profile of this user will show. Show Links. Show or hide the links. Show Contact Form. Hide or Show the E-mail form. 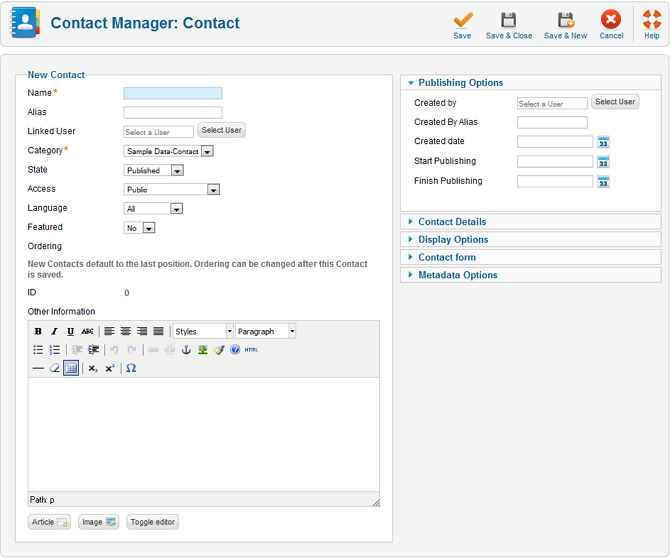 If Show is selected, a form is displayed that allows the user to send an e-mail to the Contact from the web site. Contact Redirect. Enter an alternative email address, where information will be sent.